One of the tactics the city used to try to derail the boycott was to dredge up an old law prohibiting organized boycotts. Hoping to break the carpool system and criminalize its leaders , at the end of February 1956, the city indicted 89 boycott leaders including Parks. As a show of power and support, many boycott organizers, including Parks and Nixon, chose to turn themselves in. 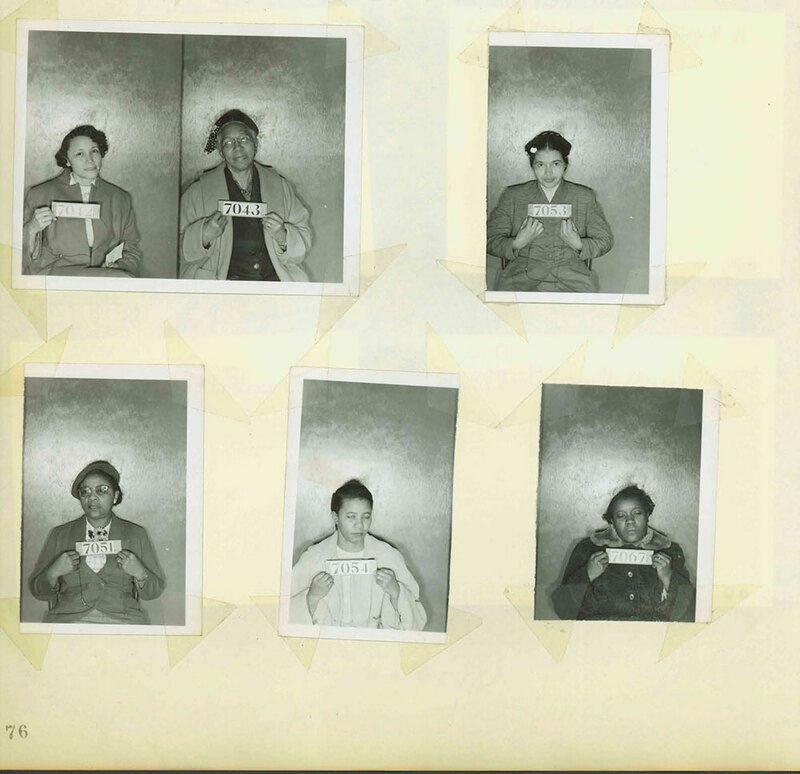 Parks was photographed and fingerprinted; indeed the iconic photo of her being fingerprinted and her mugshot #7053 date from this arrest (though they are regularly mis-attributed to her first arrest). The boycott is “more than successful,” Parks wrote a friend, “in spite of all the obstacles placed against us.” Hoping to discredit Martin Luther King and break the back of the protest, the city put him on trial first. Many black Montgomerians including Raymond Parks testified. But that legal harassment only increased people’s commitment to the boycott. Meanwhile, learning from previous cases where the state has succeeded in tying up challenges in state court, Fred Gray filed a separate case in federal court challenging Montgomery’s bus segregation. Rosa Parks was not a named plaintiff on that case. Gray didn’t want Parks’ state case to be a reason this new case would get thrown out, and Parks’ long history with the NAACP was risky. In the wake of the Brown decision, the organization was being red-baited and would be outlawed in Alabama in June 1956. Parks had been accused by many whites as a “Communist plant” or “NAACP plant” (though most seemed unaware of her work with the organization). Four women — Aurelia Browder, Claudette Colvin, Mary Louise Smith, and Susie McDonald — would serve as the plaintiffs on this case; Jeanetta Reese was named as the fifth plaintiff on the original suit but pulled out a day later under severe pressure from her white employer. On November 13, 1956, the US Supreme Court affirmed the US District Court’s historic June decision finding Montgomery’s bus segregation unconstitutional. On December 20, 1956, Montgomery’s buses were desegregated.